The largest known structure in the universe goes by the name of the Supervoid. It is an enormously large under-dense region about 1.8 billion light-years in extent. Voids (actually low density regions) in galaxy and cluster density have been mapped over several decades. The cosmic microwave background radiation map from the Planck satellite and earlier experiments is extremely uniform. The temperature is about 2.7 Kelvins everywhere in the universe at present. There are small microKelvin scale fluctuations due to primordial density perturbations. The over-dense regions grow over cosmic timescales to become galaxies, groups and clusters of galaxies, and superclusters made of multiple clusters. Under-dense regions have fewer galaxies and groups per unit volume than the average. The largest inhomogeneous region detected in the cosmic microwave background map is known as the Cold Spot and has a very slightly lower temperature by about 70 microKelvins (a microKelvin being only a millionth of a degree). It may be partly explained by a supervoid of radius 320 Megaparsecs, or around 1 billion light-years radius. Superclusters heat cosmic microwave background photons slightly when they pass through, if there is significant dark energy in the universe. Supervoids cool the microwave background photons slightly. The reason is that, once dark energy becomes significant, during the second half of the universe’s expansion to date, it begins to smooth out superclusters and supervoids. It pushes the universe back towards greater uniformity while accelerating the overall expansion. A photon will gain energy (blueshift) when it heads into a supercluster on its way to the Earth. This is an effect of general relativity. And as it leaves the other side of the supercluster as it continues its journey, it will lose energy (redshift) as it climbs out of the gravitational potential well. But while it is passing through the supercluster, that structure is spreading out due to the Big Bang overall expansion, and its gravitational potential is weakening. So the redshift or energy loss is smaller than the original energy gain or blueshift. So net-net, photons gain energy passing through a supercluster. The opposite happens with a supervoid. Photons lose energy on the way in. They gain energy on the way out, but less than they lost. Net-net photons lose energy, become colder, when passing through supervoids. Now all of this is relative to the overall redshift that all photons experience as they travel from the Big Bang last scattering surface to the Earth. During each period that the universe doubles in size, the Big Bang radiation doubles in wavelength, or halves in temperature. In a newly published paper titled “Detection of a Supervoid aligned with the Cold Spot in the Cosmic Microwave Background”, astronomers looked at the distribution of galaxies in the direction of the well-established Cold Spot. The supervoid core redshift distance is in the range z = 0.15 to z = 0.25, corresponding to a distance of roughly 2 to 3 billion light-years from Earth. They find a reduction in galaxy density of about 20%, and of dark matter around 14%, in the supervoid, relative to the overall average density values in the universe. The significance of the detection is high, around 5 standard deviations. The center of the low density region is well aligned with the position of the Cold Spot in the galactic Southern Hemisphere. Both the existence of this supervoid and its alignment with the Cold Spot are highly significant. The chance of the two being closely aligned to this degree is calculated as just 1 chance in 20,000. 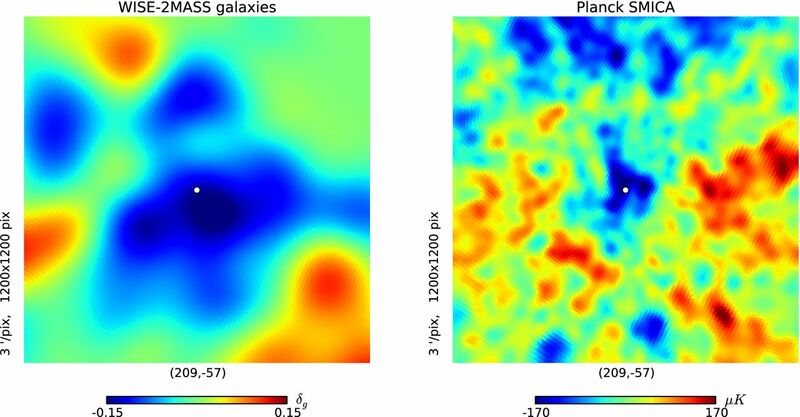 The image below is Figure 2 from the authors’ paper and maps the density of galaxies in the left panel and the temperature differential of the microwave background radiation in the right panel. The white dot in the middle of each panel marks the center of the Cold Spot in the cosmic microwave background. A lower density of galaxies is indicated by a blue color in the left panel. Red and orange colors denote a higher density of galaxies. The right panel shows slightly lower temperature of the cosmic microwave background in blue, and slightly higher temperature in red. The authors have calculated the expected temperature reduction due to the supervoid; using a first-order model it is about 20 microKelvins. While this is not sufficient to explain the entire Cold Spot temperature decrease, it is a significant portion of the overall 70 microKelvin reduction. Dark Energy is gradually smearing out the distinction between superclusters and supervoids. Dark Energy has come to dominate the universe’s mass-energy balance fairly recently, since about 5 billion years ago. If there is no change in the Dark Energy density, over many billions of years it will push all the galaxies so far apart from one another that no other galaxies will be detectable from our Milky Way. This entry was posted on Friday, April 24th, 2015 at 1:47 am	and tagged with clusters of galaxies, Cold Spot, cosmic microwave background, Dark energy, Dark matter, integrated Sachs-Wolfe effect, Planck satellite, superclusters, supervoid and posted in Dark Energy, Dark Matter. You can follow any responses to this entry through the RSS 2.0 feed.